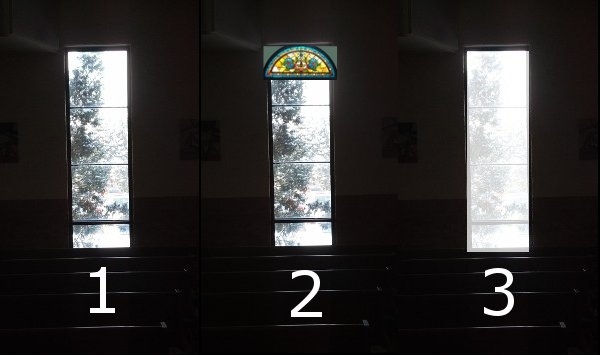 As you may have noticed in the Church, four of the windows in the back have been removed, and we are looking for your opinion. These windows in the Church were only painted windows and not “Stained Glass”. The Parish staff feels that they detract rather than add to the environment, and that the light in the Church is needed. Our options are that we could replace the painted glass that has been taken out, or leave the glass clear as it is now. We are also looking into a very simple “Stained Glass” with an arched border to tie in to the arched windows in the Chapel. The windows are being washed this week and will be washed monthly to make sure we have a beautiful effect. We have been shown some very simple, beautiful designs that would be a simple border with an etching of Mary or an Angel. Father Dan would like to keep as much light entering the Church but is certainly open to the border or some etching. Thank you so much for your continued support and also your much valued opinion.